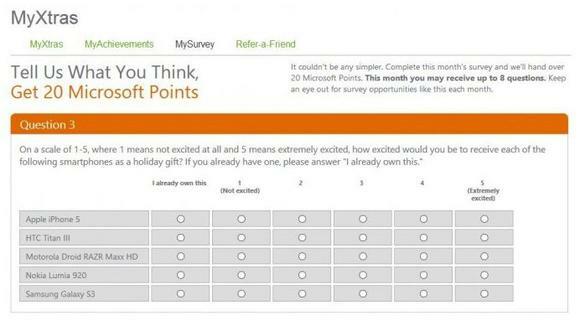 A reward survey posted on Xbox Live to see what people would be most excited to receive as gifts may have revealed HTC’s third handset, the Titan III. While the HTC 8X is a fine device, it does not really reach the heights of the Lumia 920, top Android devices or the iPhone 5. Reasons why HTC put an average device on the Windows 8 platform are few and far between; many just thought it was another scrap attempt at a smartphone by HTC. Now it seems it may be due to HTC wanting to release the Titan III later, as the Samsung Ativ and Huawei W1 are both going to be. The Titan III was mixed in with the iPhone 5, Samsung Galaxy S3, Motorola Droid RAZR Maxx HD and the Lumia 920. Some tech sites have said that this may just be a typist error, as the Titan II is already available – realistically the Titan II does not come close to what the other phones have in appeal and features. Originally named the HTC Zenith, the Titan III may be the third Windows phone, and may not even be called the Titan III. We suspect like the 8S and 8X, the phone will be named similarly. X has normally been the code-letter for high-end on HTC scales, so we wonder what the Titan III will be named. The Titan III will have a 4.7-inch screen at 720p display, with a dual-core 1.5GHz Snapdragon S4 Pro processor, 1GB of RAM, an 8MP camera and HSPA+ connectivity. While this does not look that good for users in the US, who want LTE with their smartphones, HTC may just make this a European and Asian phone. Whatever the case, it seems Microsoft have released the third smartphone, whether it was a mistake or mistime by Microsoft, we are unsure, but both parties have yet to say anything.